Very impressive, the new designs you've made here. Well worth frequent visits. I AM DOING A REPORT ON THE MAYANS. THIS SITE HELPED A LOT. THANK YOU!!! Excellent arrangement of this info. I'm going to this area tomorrow, and I was happy to read about the artists. Your homepage helped me alot on my spanish assignment. I will make sure to spread the word about your very detailed and exciting homepage.Thanks from all of us who don't know vry much about hispanic and latino culture. This site is very interesting, but I don't understand why the traditional textiles are not inclued in a category of Art. I see that only painters are consider like artists. Please, could you send me some comments of your opinion about that? Thanks to take consideration about my request rapidely! This is a wondreful site to show my daughter that we are Myan through blood. The stories aer some that my Father told to me. Thank you for keeping the flame alive. Your website is wonderfully organized and easy to use. The gallery offers a beautiful selection of Indigenous Guatemalan artists, whose works seem to closely resemble to the originals. I work for the Latin American Library at Tulane University in New Orleans. Our collection contains two paintings by Rafael Gonzalez y Gonzalez, which were donated to us this year. I'ts great to be able to see the work of others working in a similar style. I have always been in constant awe of the Guatemalan culture, its vivaciousness and vividness. No less has this journey through your home page been for me. I take trips to guatemala in june for three weeks as a mission trips for groups and enjoy the lake and all of the artists expecially at santiago atitlan. Its great to know that there is an intrest in the Maya civilization past and present. Despite much persecution the Maya population is still alive and represented everywhere. TX. Hola amigos "Chapines." Your art is very elegant. This site is the best in the www, I will make sure to spread the word about your very detailed and exciting homepage. Thanks from all of us who are here in Virginia and the rest of the United States of America. I'm a guatemalan who loves very much Atitlan. A frecuent visitor of the lake, I knew about your web site trough a postcard found in Antonio Ixtamer's home. Was exhilarating to visit your page, which I may recognice as very comprehensive. Congratulations and my sincere acknowledge for presenting the best of my country in an attractive manner. [Artist San Pedro la Laguna Guatemala] Agradecimiento profundo a las dos personas tal como Eric Noble y Joseph Johnston para promover mi arte aqui en los Estados Unidos y en el mundo atravez del INTERNET. This is a great web page. Of course I'm not a computer nerd but I guess it's pretty good. I love the paintings their beutiful. I wish I had some on my wall, BUT they would look really bad with my COOL posters of my Leo baby, OR Leonardo DeCaprio. So I guess they wouldn't look very good. HI man. I like note cards wil you e-mail back. Blake P.s. Your cards to much, take half of the price, then 50% of. Thank you for this gorgeous website. It is both informative and expressive of a beautiful culture that is unknown to most of us. I shall return many times. hola jose --- just stopped by to see the new stuff by pedro raphael. i like the cornsy dia de gracia and the rembrandtesque candlelight spinning scene. the atmospheric cathedral steps are good, too. i guess i was expecting something more overtly political from the goya of guatemala, though. but i suppose every painting can't be a life-risking expose. guarda la fe. great page! I am crazy about our mayan gliphs, colors,and culture ,since my grandmother lives in those regions.keep up the good work. I would like to know more about getting involved in the art market in Guatemala. Do you have any resources that could point me in that direction? Hi. I lived in San Pedro 1993-1994, and stayed there recently during Sept.-Nov. of this year. Really enjoyed the photos, but it made me miss San Pedro again. Great to learn about some of the people I have lived among. Anyone going to San Pedro, be sure to say hi to Sascha for me. I am trying to find out some more information about the painter NAN CUZ. Does anyone know how I can go about doing this? Estoy tratando de encontrar informacion sobre la artista NAN CU. Hay alguien que me pueda ayudar? I found this site a wonderful source of needed information. I am looking for ways to teach my son about our country, our people and the things we should be proud of. Thank you for providing me with the tool to teach him with. Hello, good to see that this page is still up! Laid off my webpage master/graphic art job... looking 4 new job. Also, any body interested in murals to be done, or help with, and film on art installations that I have been doing 1,200 to date. more info @ http://www.emlen.com/gerbstadt hope to hear from any other creative souls soon! Name: George Stevens, University of Sydney. I am in love with The Mayan Culture and support Mayans in their struggle for cultural, economical and political rights. No more ladino oppression. Excellent paintings. Hasta pronto. I think Guatemala is a hell of a country. I wish I could visit there more often. The pictures are lovely to see.People should visit there alot more. And to all the guates in L.A, Houston, Montreal and around the world represent us as people with dignity and morally correct people.Thank You. Hello, nice to meet you on the web just by surfing. I'm a painter, too, and I would like you to visit my own homepage. Best wishes! I do not think that you did a good job on this sight. I cannot even read and I am 26 years old. Please can't you make it more understandable. I still love your site. 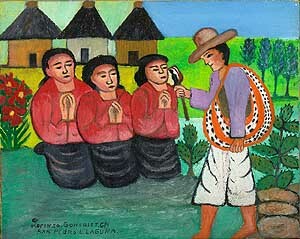 Please come and visit El Centro de la Rosa at: http://www.huichol-art.com. Your feedback will be very valuable considering your site is so beautiful. Name: Carmelita L. Gutierrez R.
very excited to see Mayan Art Work on the World Wide Web. I think it one way to expose people all over the world to the beauty of lands and cultures of Central America. Idea really valid! Sin that Iunderstand little the English language!!! Why doesn't have foreseen a multilingual system?